Firkus Aircraft Inc. is a Transport Canada approved maintenance organization servicing fixed wing aircraft. We work on everything from gliders to King Air aircraft. Team Firkus provides day-to-day line maintenance and annuals for both private and commercially registered aircraft. Firkus Aircraft specializes in aircraft importation, glider repairs, and sheet metal structure repairs for both North American and European built aircraft. We also provide composite structural repairs and aircraft recovery services. Aircraft annuals and line maintenance are routinely performed services. At Firkus, we have also helped many new businesses, such as flight schools, get all the required information they will need to be successful. Ray Firkus is the owner and president of the company. Ray has been in the aviation maintenance field for over 30 years. Working side by side his father and company founder Gordon Firkus, Ray has accumulated a broad knowledge base and holds both M1 and S licenses. Team Firkus is committed to providing the best service possible to each and every customer. Over 5 years ago Ray joined Donna Flynn at Showline Airshow Services. His 30+ years of aircraft maintenance gained from Firkus Aircraft brought a whole new dimension to Showline. 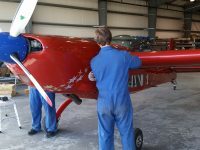 Not only can Ray Airboss, but if a performer has mechanical problems, Ray is able to assist them with the maintenance and/or repairs. This means the act is less likely to be cancelled which leads to a better show. Airshows are a high paced industry with no time for a plane to be grounded. We highly recommend checking out the Showline Airshows website for further information and about their current show information!